Fletcher European Containers manufacture food grade, hygienic, mobile and freestanding plastic troughs suitable for the food processing/ manufacturing industries, catering trade, commercial bakeries, meat plants, dairies and the pharmaceutical industry. The food grade polyetylene plastic is tough, durable and easy to clean and is ideal as a washing station for salads and vegetables, most food produce in fact or as a cleaning station for the cleaning of utensils or soaking of machine parts. The standard frame construction is of stainless steel fitted with four 100mm diameter polypropylene wheels in zinc castors with stainless castors available as an optional extra. Manufactured in our UK factory, the rotoXTR135 and rotoXTR180 plastic troughs are rotationally moulded, ensuring incredible strength and durability. The moulding process also ensures that the plastic troughs are seamless and watertight, perfect for handling liquids. Incredibly robust, the food grade plastic is easy to clean as there are no hard to clean dirt traps or crevices to navigate, making the trough units very hygienic and well suited for high care environments such as food factories. The plastic troughs themselves are available in a wide range of different colours, allowing for colour coding within food preparation areas and industrial kitchens. We are able to modify these plastic troughs to include drainage holes with bungs, or drainage plugs can be fitted to allow for effective drainage of liquids. The plastic troughs can also be supplied with matching colour coded food grade plastic lids, allowing you to efficiently cover and protect any products being stored in them. The stainless steel frames for the rotoXF135 and rotoXF180 are highly durable and hygienic, well suited for use within hygiene sensitive environments. Easily manoeuvred, the stainless steel trough frames allow you to effortlessly transport the plastic trough units to where they are required and can easily cope with the demands of industrial application within the likes of food factories and manufacturing plants. 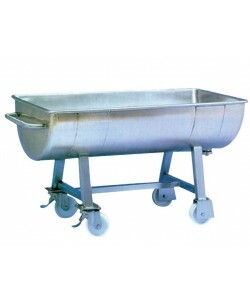 Alongside our plastic troughs, we also supply a 200 litre capacity stainless steel trough unit, the RM200SS. 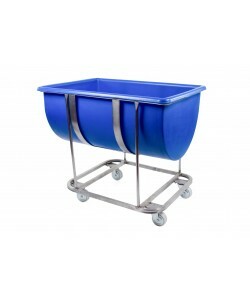 Equipped with mobile stand, these stainless steel troughs are incredibly easy to handle and are built to withstand the rigours of industrial environments. These stainless steel troughs are supplied readily equipped with a drainage point and screw plug to allow for quick and efficient draining of contents. The RM200SS is also supplied as standard with two braked castors to create a stable and secure trough unit to work from. Also within the trough units range, the CR100TRA is a standing plastic trough that can be supplied with a stand (TRSTANDA). 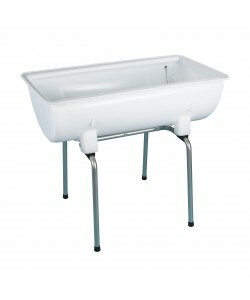 These plastic troughs are perfect for food preparation or cleaning areas. Equipped with a drainage plug as standard, the static plastic trough offers a sturdy and reliable option.